1. Place the whole potatoes and sweet potatoes in a large saucepan of boiling water and simmer for 15 minutes until only just tender. Drain and allow to cool then peel and coarsely grate. 2. Meanwhile, heat 1 tbsp oil in a small frying pan and fry the onion for 3-4 minutes until golden. Mix with the salmon, herbs, grated potatoes and flour. Season well. Mould into 8 fishcakes, press the Parmigiano Reggiano onto both sides of the fishcakes and chill until required. 3. Heat the remaining oil in a frying pan and fry the fishcakes in 2 batches for 2-3 minutes on each side until golden. 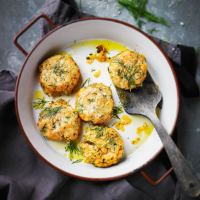 Allow the fishcakes to cool completely, then place on a tray lined with baking parchment and freeze. To reheat, allow to defrost and place on a baking tray. Bake in a preheated oven set at 200°C, gas mark 6, for 15 minutes.